Lemme tell ya another story, which is really ironic. It was a Friday morning, and my secretary and I were talking about the Polyphemus Moth. I said that seeing and photographing a giant moth like that was one of the things on my life list. I said another critter on my life list was the Hummingbird Moth. She asked, "A What? I've never heard of such a thing." So, I Googled (since I capitalize 'Googled', does that make it a 'Proper Verb'? uhhh anyway...) and showed her photos, and she thought it was really cool. At lunchtime, my secretary showed up at my desk and informed me that her sister (who also works at the University) said there was a "big butterfly with blue on it" flying around the flowers in the flower garden. So, she insisted I grab the camera and go outside to take some photos - yeah, she's tough and demanding like that. As I was photographing the "big butterfly with blue on it", which you'll have to stay tuned to see photos of (yes, I'm mean like that), I saw something out of the corner of my eye. "WHAT??? Are you kidding me?" T asked. "Nope, I am NOT kidding you... LOOK!" "Oh my gosh! It IS!" "I swear the critters just seek you out to photograph them, Misty!" click on the badge and join Camera-Critters. Really cool, Ms. Entomologist you! Beautiful, too! 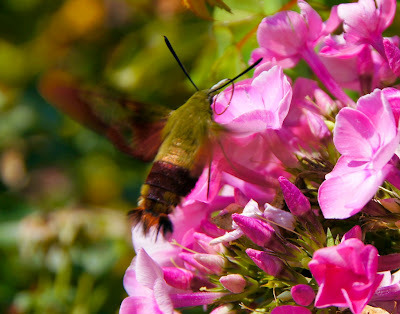 Super captures of the hummingbird moth! I have these in my garden and I love to watch them. Like hummingbirds they move so quickly I find them difficult to photograph but yours are great shots! that is amazing that you captured that on camera!!!! HI Misty...they are the greatest...I have taken way to many pic's of them..they are a constant in my flowers!! So there really are hummingbird moths?!! Cool! I'm really glad to hear that and to see your great picture. I've seen them (rarely) flitting around flowers here in the Jerusalem Hills and never knew what they were. 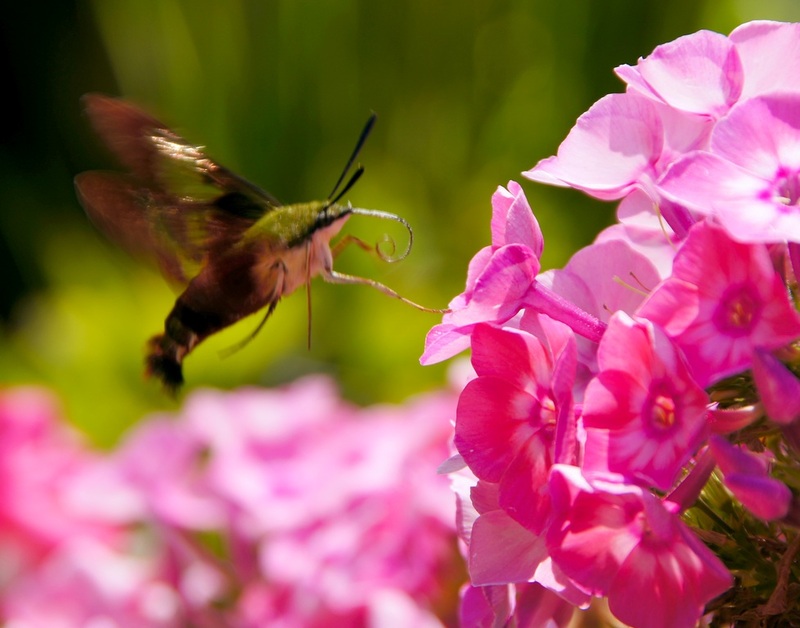 Great shots of the Hummingbird moth, Misty! They are cool looking moths. Amazing capture and what a beautiful insect(?)! Great capture. It's good to seize the moment, isn't it? Wow! That's an amazing creature & great capture. So, what's left on your life list? WAY cool!! I saw one last year, for the first time, but it didn't hang around long enough for me to get my camera. I was amazed and marveled at it for the short time it graced us with our presence. Thye are amazing aren't they? Oh, I love these moths! So fascinating. Their bodies look like they would be soft to the touch, velvety almost. Fantastic capture, Misty! Really, really cool...and very ironic 8v) Nice shots, Misty. those are amazing shots. Especially the in flight. Love God's creation. Beautiful pic! Wow! I've never seen a hummingbird moth! Beautiful shots! BTW - did you know you've won a prize on my blog? We have tons of these on our butterfly bushes. I never heard of a hummingbird moth until last summer when I saw one. At first I thought it was a hummingbird. Nice captures! Nice post and shots, too. That is amazing! I've never seen one of these, and I'm so glad I have now. Very cool. I saw you at Linkytools sidebar, and thought I'd follow you. Wow that really is neat. I had never heard of that type of Month either. How pretty in an odd way.